It’s quite dusty capital, Banlung, is located in the central highlands of the province, approximately 365 miles (586 kilometres) from Phnom Penh and reminds one of a wild western city, even if it’s the wild east. Its wide red laterite roads are bordered by new, recently build houses replacing the older ones. The centre of the town features a lively marked with all the needful things. 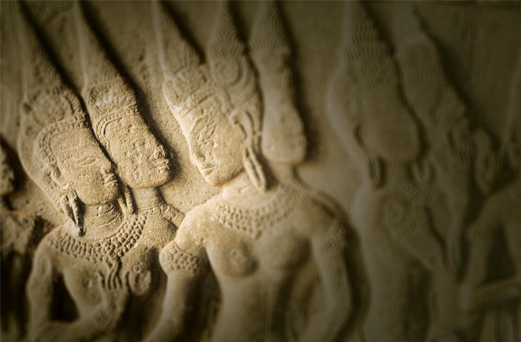 Ethnic Cambodians make up only 10-20% of the country’s total population. Remnants of an ancient volcano exist near to Banlung in the form of a crystal-clear lake that was formed after the active volcano went dormant. There are also a few ancient lava fields that testify to the fact that the area was quite lively at one time. Beautiful waterfalls, clear rivers winding through stretches of jungle, and rolling hills that meet mountains near the Vietnamese and Lao border provide a full agenda for nature lovers. Non-structured, low-impact, custom trips to outlying villages and natural areas can be organized (strictly by yourself or with help from a guesthouse). There is a few foreigners living in Banlung you’ll definitely meet while walking in the streets you can ask for actual tour offers, prices etc (change spontaneously). You will soon realize that this area hasn’t seen a lot of tourists in the past. If you will visit the hill tribe people in the further areas outside of Banlung, don’t be surprised if they look appalled at you. They just haven’t seen many, if any, foreigners. Yeak Laom Volcano Lake: This beautiful place is not far from town and is great for a swim, picnic, or hike around the crater rim of the old volcano. Due to the lake’s tremendous depth of 48 meters, its water is exceptionally clean and crystal clear. The lake is almost perfectly round and measures around 750 meters in diameter. It has a small informative local museum thrown in to boot. In 1995 the governor of Ratanakiri officially set aside a 5,000-hectare (12,350-acre) protected area, of which the lake is a part, and in 1996 got help from the International Development and Research Centre of Canada and the United Nations Development Program to develop an effective resource management program. This area represents Cambodia’s finest attempt at preserving a site. Full-time rangers work to ensure the area is protected. They receive regular training and have put up signs throughout the area reminding people not too littler, wash clothes or toilet in the lake. That’s amazing for Cambodia. 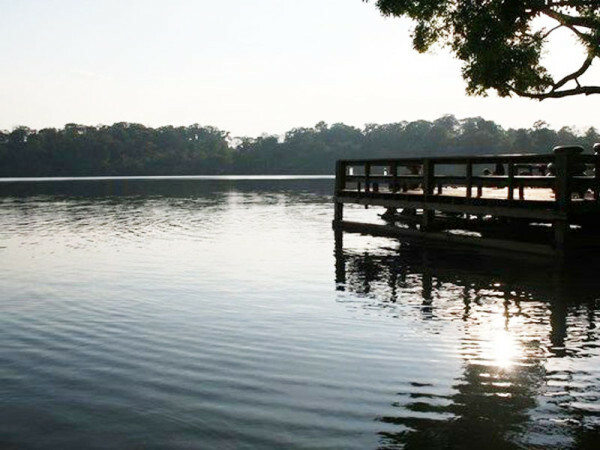 The main swimming and picnic area features a nice wood deck that’s great to use for a jump into the crystal clean water. 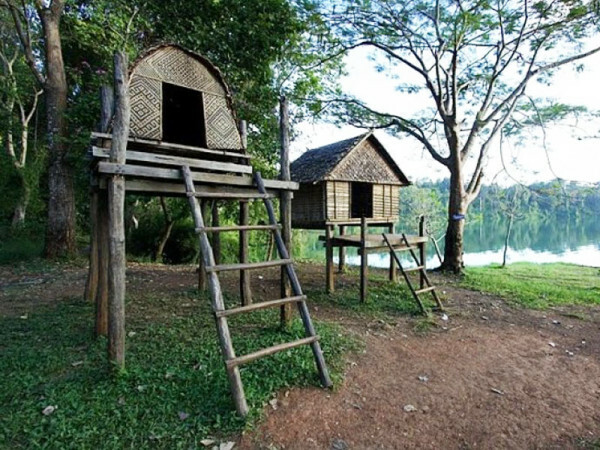 Nearby, park rangers erected a couple of examples of hill tribe construction in the form of non politically correct bride and groom homes, where the man gets the elevated home (his status in the relationship) and the woman has the one nearer to the ground. 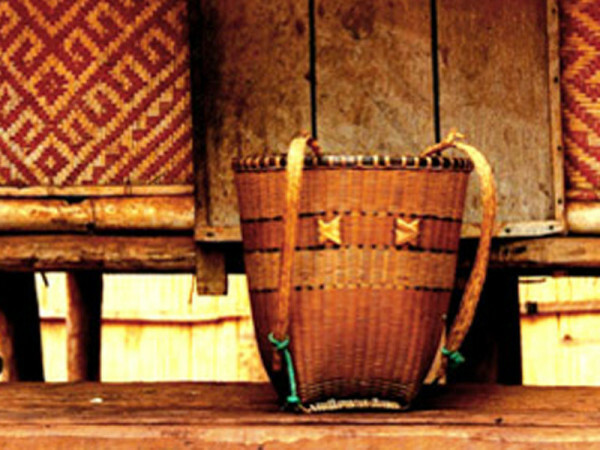 A few hundred meters down is the Cultural and Environmental Centre, which has information about area history and displays of local hill tribe tools and handiwork. They also sell some of the handicrafts made by the hill tribes: musical instruments, beaded belts, shirts, and hats. From the centre you can take a nature trail around the entire crater rim. King Sihanouk had a chalet built on the shores of the lake and used it during the 1960s. It was destroyed in the 1970 war between the Lon Nol government and Khmer Rouge guerrillas. You can still see the remnants of this and also-indifferent spots around the lake-trenches that held gun emplacements during the fighting. 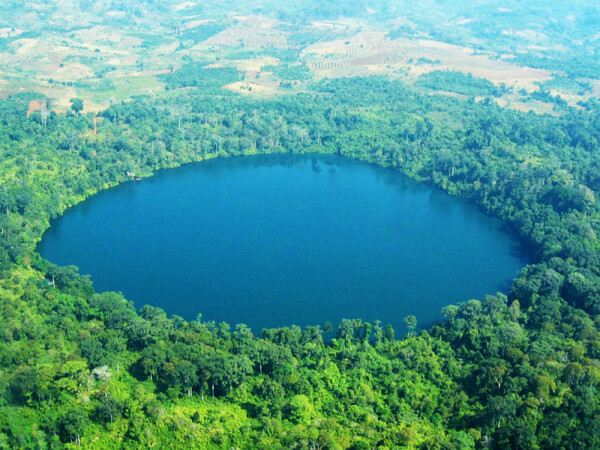 The original inhabitants of the area are the Khmer Leu hill tribe people, who have always recognized the lake as a sacred place, home to the spirits of the land, water, and forest. Here those spirits interact with humans and, according to the local legend of Yeak Laom Lake, fabulous, spiritual aquatic beings reside here. The surrounding forests of the area are also said to be the home of spirits and therefore can’t be cut. This helps to explain why the hill tribe people took so strongly to the idea of protecting the area. 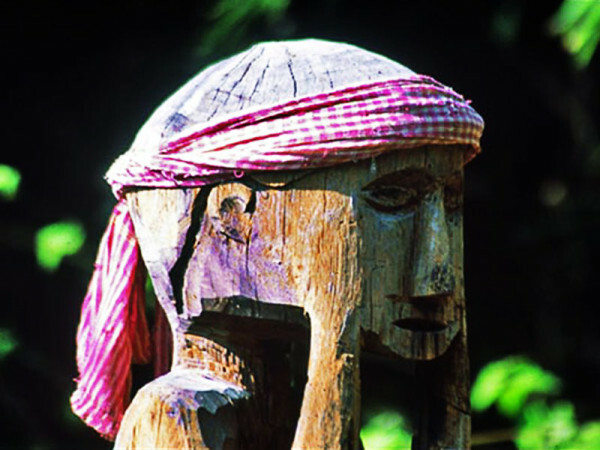 It’s very easy to get there – just go east from the Independence Monument circle 3 km to the Hill Tribe Monument circle (two indigenous figures) and go right for about 1,5 km to the entrance gate. 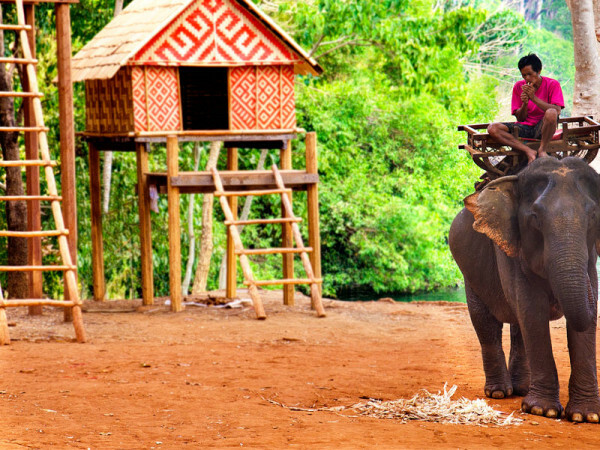 The local hill tribe community connected to the lake get to collect an entrance fee, giving them a source of income and revenue for protecting their resource. It?s US$1 per person and a few hundred riels for a motorcycle.